← If Oklahoma Gets Their Foot in the Horse Slaughter Door ~ It’s All Over ~ SIGN NOW. Dogs Smuggled for Food Rescued by SOI Foundation ~ Please Support This Life Saving Cause. For the past three days an ‘Environment Films’ crew has been working under cover with The Soi Dog Foundation and Thai Authorities in North East Thailand – we’ve been tracking down and following illegal dog smugglers for the documentary we’re producing about the illegal dog meat trade. ‘Shadow Trade – The Price of Loyalty’ will be finished later this year and will be sent to the leading Internation…al Television broadcasters for consideration. 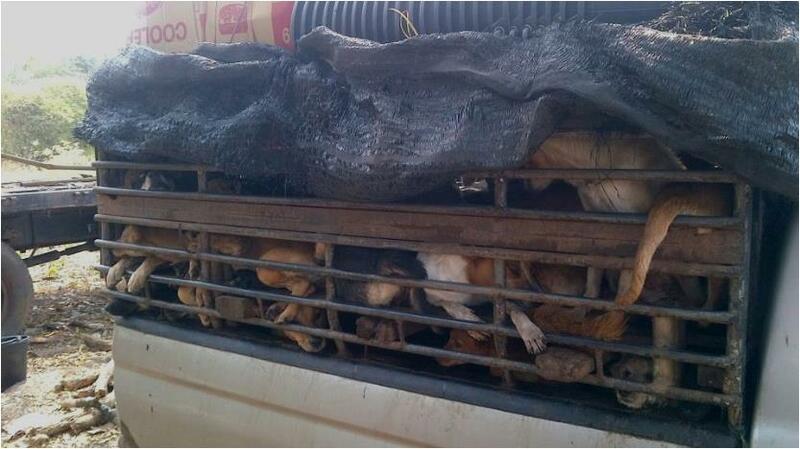 This photograph was taken this morning – 70 dogs in one truck, 2 had sadly died. The drivers were arrested and thanks to The Soi Dog Foundation the dogs are now in a shelter with food and water and will receive medical checks soon. The Soi Dog Foundation have over 2,000 dogs in their care – you can contribute to the food costs here: https://www.facebook.com/SoiDogPageInEnglish/app_195408993822678 More news will follow soon about our documentary, which is still being filmed and edited. Thank you very much for your support. It means a lot. An update on the dogs rescued early Friday morning. The dogs were found in very poor condition and they have been moved to a local livestock center where they can be cared for. The BLACK truck belongs to Soi Dog Bangkok and the silver truck was confiscated from the dog trader. Our agent has been working for several days on the trail of the dog trader. Funding these interceptions is expensive as is caring for the rescued dogs. Soi Dog is presently spending in the vicinity of 1,000,000 Thai Baht each month for food and other support for the sheltered dogs. Posted on February 10, 2013, in Animal Rights, Fund Raising For Animals Emergencies. and tagged Dogs For Human Consumption, Smuggled Dogs, SOI Dog Foundation. Bookmark the permalink. Leave a comment.